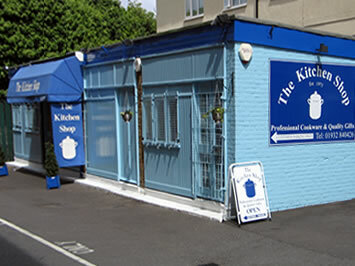 The Kitchen Shop, located in Ship Yard off the High Street, has been a family-run business in Weybridge for over 30 years, supplying quality products to the cooking enthusiast & professional chef alike. As you walk through the door, the first impression is of an Aladdin's Cave! There's an overwhelming selection of cookware, kitchen equipment, utensils, gadgets & gifts on offer. From everyday kitchen necessities to dinner party tableware & celebrity chef endorsed products, The Kitchen Shop can satisfy most requirements from an extensive range & is always happy to source more unusual or elusive items! The staff are experienced & friendly, willing to give help & advice, or allow you to simply browse. 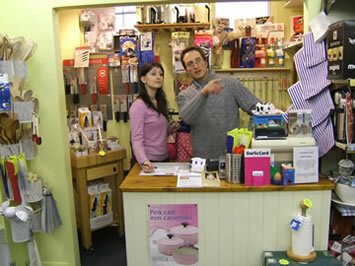 We also offer a delivery service, a wrapping service, wedding lists, gift vouchers & knife-sharpening. For your convenience we're able to provide FREE CUSTOMER PARKING and have a children’s play area. With a truly tempting array of products on offer, at refreshingly affordable prices, The Kitchen Shop is well worth a visit. Nick, Gemma & the team look forward to welcoming you. Find us between Waitrose and The Ship Hotel. ... Plus much more. Come and browse! give help & advice, or allow you to simply browse.